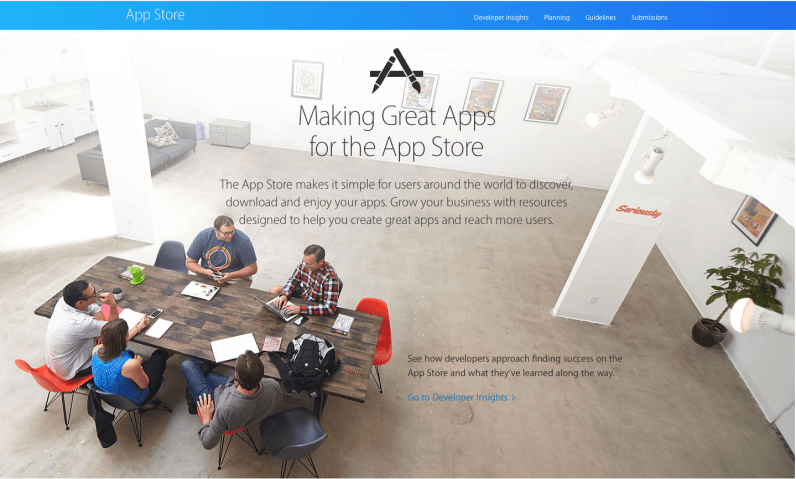 Apple has updated its App Store developer site with a new section aimed at discussing best practices and business growth via the App Store. Several new articles and videos will provide best practices for discovery, using a freemium model for generating revenue and engaging users with updates. There’s also a section dubbed Developer Insights which has input from real developers discussing their successes in the App Store. The ‘Discovery on the App Store’ will provide details on how the App Store is curated, an overview of the different editorial sections and insight on what commonly featured apps have in common. There’s also a form for developers to fill out, should they want their apps to be featured. ‘Using the Freemium Model’ discusses just that; making a free app generating revenue using in-app purchases. In the first case study, Apple will be featuring SGN, Originator and VSCO. One unique section is ‘Releasing App Updates,’ which walks us through the weird and wonderful world of engaging users via updates, and planning a roadmap around incoming features. Slack, BuzzFeed and Smule are all featured. ‘Choosing a Business Model’ is one every developer should take a look at. It goes over the four business models you can choose — free, freemium, paid and paymium — to help you decide which is best for your next app. Called ‘User Acquisition Marketing with App Analytics,’ that section goes over how developers can use Apple’s analytics to answer tough business questions like which marketing campaigns work best, or what drives downloads. If you’re not sure what section you’ll need to dive into, or just need a place to start, there is also a category chooser with a brief overview of each of the above sections. You can even compare categories definitions side-by-side to make sure you pick the right one for you. It’s the first time Apple has gone beyond making its developer portal more than just a place where developers can find info on tools they’re using in apps or a hub for managing apps they’ve distributed to the App Store. In a way, it’s fair to consider that Apple’s developer portal is a lot like Google’s, which routinely offers these types of insights and guidelines. This should also help independent developers get a better idea of how to ramp up for success rather than go it alone. While it could lead to a bit of gentrification in the App Store, getting a better idea of what’s successful — and what Apple looks for when choosing which apps to feature — can go a long way, especially if you’ve got a really unique app.